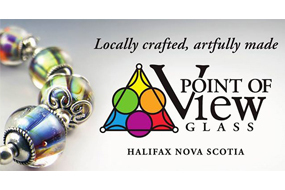 Point of View Glass offers exquisite crafted jewellery and gift-ware hand honed by several of the best Master Artisans here in Nova Scotia. In this exclusive artisan gallery, you will be delighted and tempted by whimsical glass fused gift-ware and one-of-a-kind Italian Glass Lampwork Bead jewellery created with 925 sterling silver by designer Katrina Doucette. On cruise ship days, meet the maker and watch Katrina perform live demonstrations of the Lampworking process (glass bead making) as she creates her signature Nova Scotia Bead (fits Pandora® style jewellery). Timeless, classic and breathtakingly beautiful are the work of silver/gold smiths Peter Lawrence Design and Constantine Design who elegantly incorporates the finest silver, gold and precious stones into their finished pieces. Be prepared to fall in love with a piece or two! Perhaps the bling of Swarovsky® crystal is more to your liking. Look no further than at the most lovely jewellery sets from Snaz Designs by Nancy Allan. Who wouldn’t want a little more snaz in their life? Looking for that something special which is quintessentially Nova Scotian? We have incredibility detailed Scrimshaw carved by Kevin Neil. His collections include cuff links, paperweights, letter openers, pocket watches and pendants to name a few. Kevin carves on re-purposed piano key ivory and/or mastodon which is inlaid into hand turned exotic woods. Truly stunning and unique! Point of View Glass’s offerings are original wearable pieces art that gracefully accompany the wearer throughout their day. The quality of craftsmanship is second to none and we take pride in being locally crafted and artfully made. Follow Point of View Glass on Twitter, Facebook, Instagram, Pinterest and Esty.